Halifax council has decided 10 affordable housing units are worth more than 36. 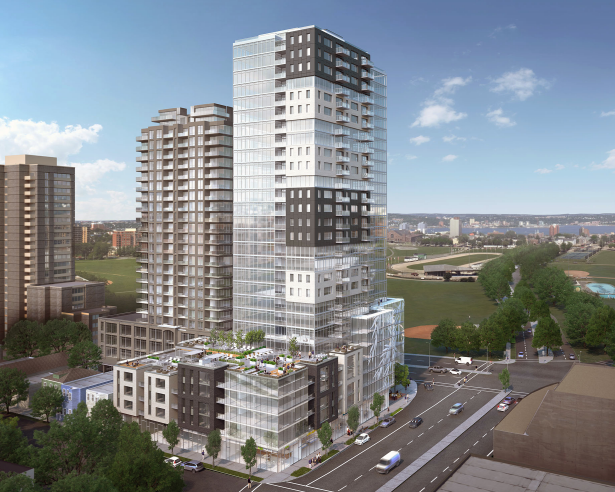 On Tuesday, councillors approved a motion moving forward with a 25-storey height for the proposed Willow Tree tower at the corner of Quinpool Road and Robie Street in exchange for some below-market rents and other public benefits. Previously on Willow Tree, a raucous public hearing back in January ended with council deferring its final decision on the development in favour of a supplementary report looking at exchanging height for affordable housing. Planning staff came back this week with a formula found in the draft Centre Plan that takes into consideration the ground floor area ratio of the building to calculate how much public value HRM should get for allowing an increased density. Under that formula, Willow Tree equals out to $3.27 million in public benefit or 36 affordable housing units for 15 years. Ignoring that, Halifax West Armdale councillor Cleary instead “reverse engineered” his own formula that calculates a public benefit of $900,000, to be spent on 10 affordable units. It’s the same proposal Armco brought to January’s public hearing, in the hopes HRM would allow the additional five storeys the company says it needs to make the project financially viable. Cleary’s motion includes the $900,000 value in affordable housing, as well as a requirement for an additional two metres of sidewalk setback and the burial of overhead electrical and utility wires. The councillor says that works out to close to $2 million in public benefits. During Tuesday's debate, Cleary told his colleagues they could approve 25 storeys today and get 10 affordable units, or approve 20 and get zero. But if the goal was to create affordable housing, councillor Tim Outhit asked why not reject the proposal outright and make the developer come back with a new design under HRM’s long-awaited Centre Plan. Density bonusing for a 20-storey building in that scenario works out to between 21 and 29 affordable units, making the whole affordable housing argument “pretty sketchy,” according to Outhit. Those units would entirely be dependent on Armco returning with a new proposal at 20 storeys, however. There’s no outright guarantee that would occur, though the developer has been trying to build something on the site since 2014. Originally, APL proposed two towers of 22 and 11 storeys on a shared podium. Planning staff rejected that design due to its height, mass and density. The developer then returned with an increased height of 28 and 12 storeys, before eventually settling on a single 29-storey tower. The previous city council approved that design—against the recommendations of staff—but it was pruned back to 20 storeys after 2016’s election to better fit planning principals set out in the draft Centre Plan. Cleary’s motion was ultimately approved 14-2. Austin and Lorelei Nicoll were the only votes against. The motion now triggers a new bylaw amendment process, meaning Willow Tree will once again come back to City Hall for another public hearing. Halifax council voted nearly two years ago on a target of 5,000 new affordable housing units by 2021. So far that number sits at zero.